The Spartan Economy Sr. offers all the great perks of the Spartan Economy Jr. It has an easy pedal release that converts a 2-wheel hand truck into a 4-wheel platform hand truck with little effort on your part. 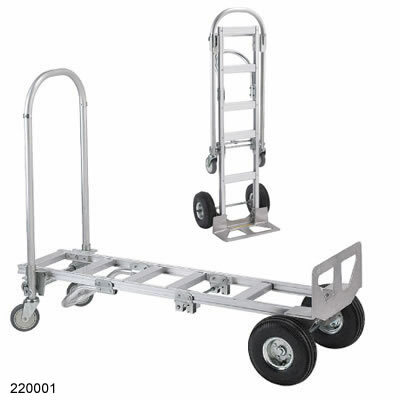 It will carry up to 500lbs as a 2-wheel hand truck, and 1000lbs as a 4-wheel platform. Its two 10” pneumatic wheels and two non-marking swivel casters to help make your “move” an easy one. In addition to all these great standards of the Spartan Economy class of convertible hand trucks, the 41lb, lightweight aluminum Spartan Economy Sr. also boasts a height of nearly 62 inches, making it perfect for moving larger items. Check out the Junior model Wesco Spartan. See what other high quality convertible hand trucks we offer. 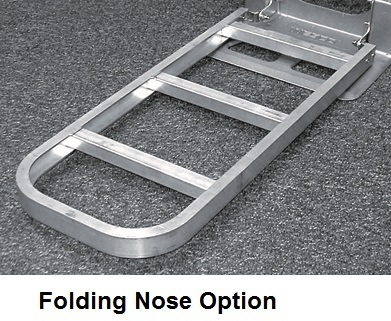 Handtrucks2go is the best choice for all your warehouse equipment . Frame Bed: 12" x 51"
Second purchase of a Wesco Spartan. Solid built, easy to assemble and quick delivery!!! I recently purchased a Wesco Spartan Convertible Hand truck for my snack business. I am well pleased with the speedy delivery free of charge and easy assembly of this product. I have used it for about a week now and would highly recommend this product. I have used Wesco handtrucks in the past and will continue to use them. Hand cart seems great so far. Great price! I added on the 30" extension which is awesome for smaller loads. I don't have to completely breakdown cart. This is our 3rd hand truck. As our company continues to grow so does our need for more handtrucks. Advantages: Strong reliable trucks. All three are filled every day. This equipment certainly meets my expectations. The service was very professional, the pricing good, and the web site ordering process simple. I bought this model in 2001 and now bought another as I needed it. Service is prompt and hand truck was here in just days.Easy to put together, well built and a great value for the price. Fast ship, easy to put together, and very esay to use. Had no problems couldn't be happier Thanks. Good durable truck. I have it 4 stars bc i didn't realize some assembly is required.